14K Solid White Gold Die-Struck Christian cross necklace pendant measuring 30mm tall (including bale/hoop) x 14mm wide (that's approx. 1.18" tall x just over 1/2" wide). "And they said, Believe on the Lord Jesus Christ, and thou shalt be saved, and thy house" (Acts 16:31). 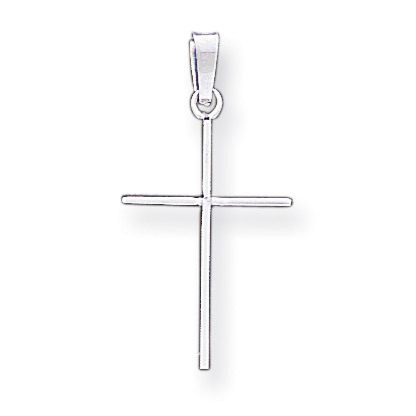 We guarantee our Plain 14K White Gold Cross Necklace Pendant for Women to be high quality, authentic jewelry, as described above.